Today is the last day of our FNS Challenge, and we are glad! We’re getting down to the last scraps of food that we purchased for the week, and most of us are eating soup today! 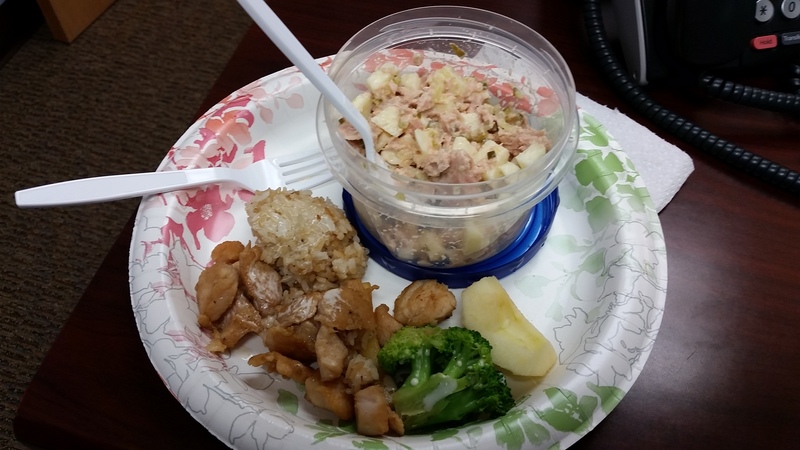 However, our co-workers that aren’t participating in the challenge were very generous today – sharing a portion of their Chinese food with one employee who only had a little tuna salad left. And even though we know accepting freebies is discouraged (because not everyone on the FNS benefit is afforded that luxury), we needed it! Those of us that didn’t plan as well are really feeling the hunger pains today! Though it was difficult, this has been a great experience for our participants. We’ve realized the amount of money we waste each week on food, utilized the power of coupons and deals, and appreciated the opportunity to step into someone else’s shoes for a week. We understand now that we are truly blessed to be as fortunate as we are, and we are more committed to giving back to those who live on this budget everyday. We’re excited to keep going back to the Food Bank of CENC’s Durham branch to sort more food (hopefully not potatoes, though) to help the hungry in our state… And the next time will certainly have more meaning for us after this experience. We wanted to extend a special Thank You to the Food Bank of CENC for challenging us to live on $4.06/day, and for all the work they do to help feed our neighbors in need. And even though the week is over, we would encourage anyone to try out this challenge for 5 days – You will gain a new perspective on what it means to be hungry! Jennifer has over 5 years of experience in the marketing industry - all of it spent in the Triangle area. She graduated from UNC-Chapel Hill in 2008 with a degree in Psychology and began working at a local marketing agency as the Office Administrator. She moved her way up in the company, eventually becoming the Director of Project Management. But marketing is her true passion, so she gladly took the opportunity to join the Thrifty team as Marketing Manager. Jenn enjoys photography as a hobby and is working on getting a website of her photos together to share with the world. She also spends most of her time chasing around her two Scottie puppies, Angus and Duncan. Sign up for the Thrifty Newsletter for news, special offers, and all things Thrifty!